I’m bored of Winter. As much as I love a berry nail, or a chic navy polish, I am more than ready for pastels. I’ve been rummaging around in my nail polish case and pulled out some of my favourite shades from last season, as well as some top coats to make them a little bit more unusual. My favourite combination at the moment is the Nails Inc Mayfair Lane Gel Effect polish, with Essie’s Summit of Style ombre-style glitter at the base of each nail. The Nails Inc polish gives a lovely glossy high shine, and goes on really evenly even when you apply in a rush. It’s by far one of the most long lasting polishes I’ve ever tried, I can often go a whole week without having to re-paint my nails. I loved Summit of Style at Christmas, the glitter is so festive, but adding it on top of a pastel shade makes it perfect for spring too. 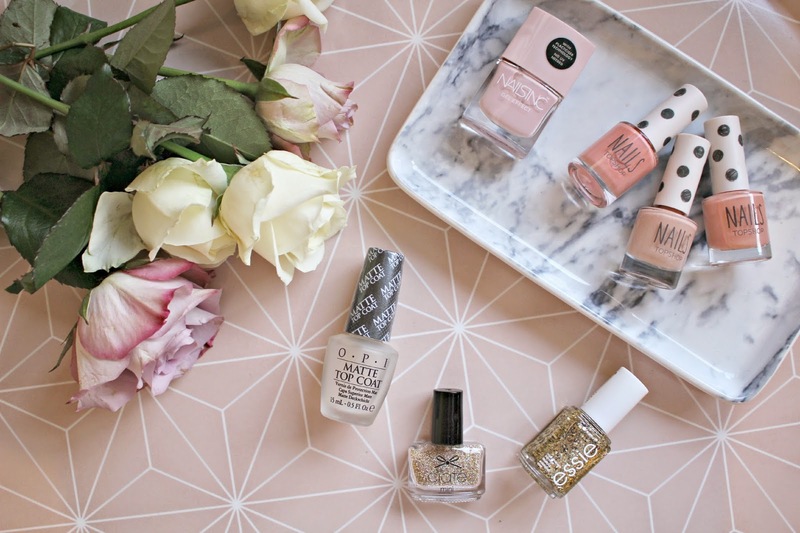 For the greatest range of pretty pinks, Topshop is my number one nail polish brand recently. They are super value at just £6 a bottle, and their colour selection always has the latest trends. Currently they’ve got a big range of iridescent and metallic polishes as well as a whole host of very wearable pinks. Pink is a great shade to use with a Matte top coat, giving a very girly milkshake look to your nails. I use the OPI Matte Top Coat to add a chic matte finish over any of my polishes but am currently loving it over light pink in particular. If I’m feeling particularly playful, I’ll create an accent nail by covering one nail in the Ciate Nail Caviar. I’ve got the little pot of champagne toned caviar which has a rose gold glimmer. So pretty! Previous Post My Favourite Websites!